Chicken pox is caused by a virus and, like other viruses, antibiotics will not help this illness unless other complications such as infection occur. Basic treatments for battling a viral type illness include medication such as acetaminophen to control fever and aches and pains, plenty of rest, and drinking plenty of liquids. ASA, aspirin, or acetylsalicylic acid should be avoided as a pain killer or fever reducer because of the possibility of the development of Reye’s syndrome when chicken pox is present. For actual chickenpox treatments, the focus is generally on relieving the major skin symptoms of rash, itch, and blisters. This can be done easily in the home and a visit to a doctor should not be required unless there are indications of complications. Calamine lotion can be used to reduce the itchiness. Others have suggested the use of oatmeal baths to reduce the skin itch and discomfort from the rash. It is preferable to keep the skin cool. Wearing light clothing can do this as well as avoiding hot baths or showers. Hot environments or activities that promote sweating will only exasperate this uncomfortable skin condition. Antihistamines may also be used to relieve the itch or rash symptoms and make the infected individual more comfortable. A valuable treatment is prevention of infection. This usually means keeping the open skin sores clean and avoiding scratching. For younger children, who have difficulty controlling their urge to scratch, it is useful to cut their fingernails short and ensure they are smooth. Another option is to wear gloves or mitts. Chickenpox themselves can lead to significant skin scars, but excessive scratching of the skin will likely promote or intensify skin scarring. Studies have indicated that the chickenpox vaccine is good for up to ten years at least, but more research is required to determine if a second shot or booster is required after that time period. Typical side effects of this vaccine are similar to other vaccinations. There will be soreness, redness, and swelling at the injection site for about one fifth of injected individuals. There is a slight chance (up to five per cent) of a mild chickenpox type skin rash developing one to four weeks after the shot. The symptoms are quite mild with very few sores or blisters forming on the skin. In adults, mild shingles may develop for up to a few months after the injection. How effective is the chickenpox vaccine? Estimates are that the vaccine is 70 to 90 per cent effective in preventing chicken pox. In addition, with the vaccine the chance of the individual becoming severely ill should they get chickenpox is greatly reduced. For more information on the chickenpox vaccine, talk to your family doctor. Acyclovir is a prescribed medication that is used to decrease pain and accelerate the healing of skin sores caused by herpes, shingles, and chickenpox. It comes as a tablet, a capsule, or a suspension (liquid), and is taken by mouth. In most cases, Acyclovir is not prescribed for children unless the symptoms are more severe than average, but this would be a physician’s decision. A final note. 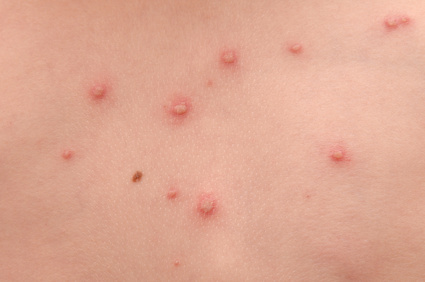 Some parents believe that it is best to have their child get chickenpox and get it over with and often intentionally expose their children to infected individuals. This is not recommended because there is always the risk of complications occurring wih chicken pox.